It’s been a busy fortnight for Star India – defined by bets, battles and business momentum. The broadcaster has been busy selling and producing the Indian Premier League (IPL) and recalibrating Star Plus while battling with Airtel and Dish TV on carriage deals. 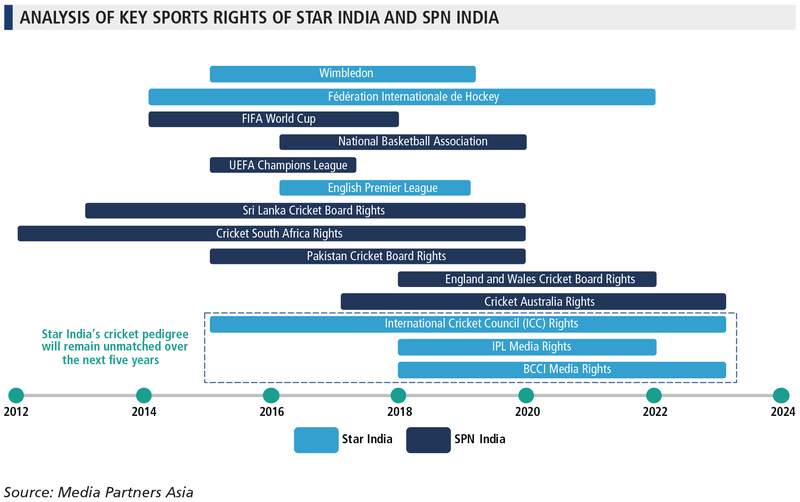 The company finished last week by winning a big prize, BCCI cricket rights over 2018-23, edging out immediate competitor Sony (click here for a chart comparing key sports rights for Star and Sony in India). In a market where competition and scale is being redefined by Amazon, Facebook, Google, Netflix and homegrown major Jio, Star recognizes the long-term value of owning and controlling premium sports properties. This, combined with investment in Hindi and regional entertainment, will help Star dictate dynamics in India’s TV & OTT video sector, which is expected to grow at a 13% CAGR over 2018-23, according to Media Partners Asia (MPA). Having won IPL rights last year, Star has further consolidated its leadership in cricket by retaining the 2018-23 BCCI rights with a Rs61.4 bil./US$944 mil. bid, a ~60% cost escalation compared with the previous cycle. The per-match value is 10% higher in comparison with the IPL, making BCCI rights India’s most expensive sports IP. The latest issue of MPA’s India Intelligence & Insights looks at the market impact and economics of Star’s audacious US$3.5 bil. outlay on cricket rights over the past few years, and how industry dynamics will change as a result.